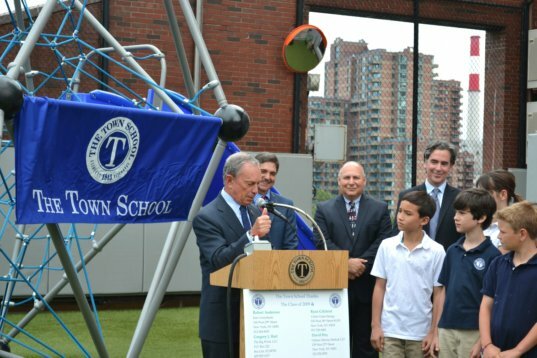 This week marked the very first installation of a wind turbine at a New York City school. 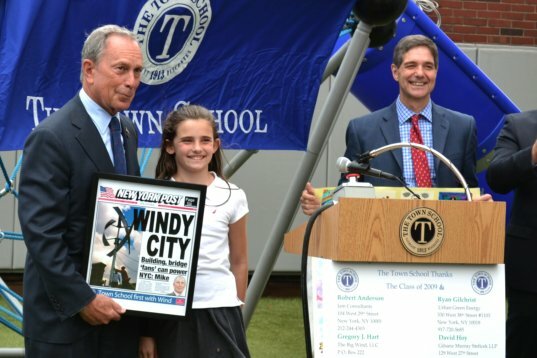 New York Mayor Michael Bloomberg visited The Town School on Manhattan’s Upper East Side Monday afternoon to activate a wind power system at the landmark nursery- eighth grade school. The eddyGT wind turbine, designed by Urban Green Energy, will add to the school’s sustainability curriculum while also providing it with wind energy. The turbine was a gift to the Town School from the graduating Class of 2009, but the process to get it up and running (read: scoring the permits required to install the turbine on top of the school’s roof) took three years. It turns out that the class had purchased the turbine before the change in an ordinance that allowed small wind turbine installations in New York City. But while it took City bureaucrats a few years to process the required documents, it did not take long for Mayor Bloomberg, an advocate of developing creative ways to source renewable energy, to flip the turbine’s switch. With an output of one kilowatt, the turbine will only meet a sliver of the school’s overall needs but is also a symbol of The Town School’s sustainability agenda, a program that has included local farm visits to understand how food is grown as well as an aggressive tree planting project. The school has also installed solar panels and the wind turbine will complement the school’s renewable energy portfolio. Hence the wind tower brings sustainability alive and can spark questions that are not possible from viewing a web site or watching a film. The wind turbine is part of PlaNYC, the city’s sustainability program and the Town School is also a charter member of the Green School Alliance. With all the rooftop space schools across the country offer, The Town School’s investment is one example of how schools and universities can help generate power as fossil fuel prices are certain to go no where but up in the coming years.